Dehydrobenzene and Cycloalkynes deals with the problems associated with the production and reactions of dehydrobenzene and of the related fields of dehydroheterocycles and cycloalkynes. 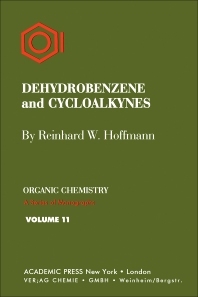 This book also describes the various synthetic applications of dehydrobenzene and provides a list of reactions in which dehydrobenzene occurs as an intermediary. The text explains the generation of dehydrobenzene by cleavage of cyclic systems, by photolytic methods, and by free radical reactions. Nucleophilic and electrophilic monodentate attacks on dehydrobenzene, as well as, bidentate additions to dehydrobenzene yielding cycloadducts. The book also notes that dehydrobenzene is not only a transition state but can be an intermediate of characteristic selectivity and lifetime. The reactions of dehydrobenzene in the gaseous phase affirm that the existence of dehydrobenzene is not restricted to the presence of a solvation shell. The researcher can then study the molecular structure of dehydrobenzene when its existence has been fully established. The text also extends the principle that the dehydroaromatic intermediates can be obtained by abstracting two adjacent hydrogen atoms from an aromatic substrate different from the 1- and 2- positions to arrive at a 1,3- and 1,4-dehydrobenzene. Researchers and scientists whose works are associated with organic chemistry, analytical chemistry, molecular physics or physical chemistry will find this book valuable.